Hybrid Instruments with 3-D printed components showcase the future of music. 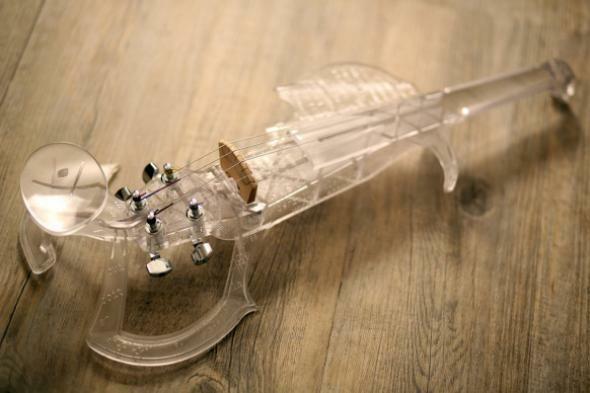 Is this Skeletal 3-D Printed Violin the Future of Musical Instruments? 3-D technology updates a classic. It’s a 3Dvarius, a 3-D printed electric violin. It’s based on the renowned Stradivarius violins crafted by the Stradivari family in the late 1600s and early 1700s, but you’d have a hard time sleuthing out the shared DNA between the two machines. It is, as Bernadac says, “a new kind of musical instrument,” one with an algorithmically optimized weight and a digital sound. It also may well be a harbinger of what’s to come for musical instruments. 3-D printed instruments have similar advantages to 3-D printed automotive parts, or even 3-D printed body parts: if you can design them with algorithms and digitally iterate on them again and again, you can trim excess weight and wind up with something that’s all function before you’ve even created a resin prototype. The 3Dvarius violin, Bernadac says, is optimized as such and lets its player move more freely. Instruments made from synthetic materials are also more durable. Luis Leguia is the inventor and founder behind Luis and Clark, a Massachusetts company that’s paved the way for carbon fiber cellos and violins. Leguia was a symphony cellist for years and saw the potential for a new material in the early 1990s, while sailing his catamaran alone. Turns out, you hear things when you’re alone. Near the hull, he says, the water swirls around and creates a vortex that emits a low, musical hum when it comes in contact with the fiberglass. With that observation in mind, he later made three prototypes. The carbon fiber design proved better than fiberglass, and he soon started production. After 15 years and some 1,500 instruments, Leguia says he’s had to make just four repairs. Traditional violins and cellos, typically made of spruce and maple, aren’t quite so durable. “In fluctuating climatic conditions—hot, cold, damp, dry—those will sometimes come apart,” Leguia says. Still, there are traditions, and the fact Stradivarius instruments are renowned for their sound (even if blind tests and acoustical analysis has found no significant differences between Strads and instruments of comparable quality). For years scientists and luthiers have speculated on what exactly makes a Stradivarius sound like a Stradivarius. The wood has a special resonance, but theories have also bubbled up about the varnish used, or the effect that imperfections and modifications can have on a violin’s sound. A few years ago a radiologist in Minnesota decided to run one from 1704 through a CT scan to find out more about the instrument’s anatomy. Each was, like people, unique. In his Journal of New Music Research report on the 3-D printed flute, Zoran writes, “in traditional musical instrument making, the importance of merging traditional designs and methods with the ability to use new technologies has always been a major theme.” He believes the same is true now, and that engineers and designers should be looking for hybrids. That’s what he did for his Chameleon Guitar design, another MIT-era project, which preserves the wood body of a guitar but incorporates a digital resonator under the guitar bridge. The result, he writes, is a more flexible range of sound than you would typically find in an acoustic guitar. Likewise, Bernadac’s 3Dvarius combines a single piece of stereolithographic printed plastic with traditional violin strings and tuning pegs adapted from a guitar. It allows for a new kind of sound that Bernadac says he hopes other musicians will experiment with. This need for hybridized craft doesn’t necessarily render 3-D printed instruments totally irrelevant. Kelland Thomas is the associate director of the University of Arizona School of Information, a jazz musician, and a recent recipient of a DARPA grant that will fund his work on developing an intelligent computer system that can play an improvised jazz solo. To do that, Thomas needs as much information as possible on what happens in the human brain during musical improvisation. The best way to discern that is through MSRI scans, but you can’t send a person through one of those machines with a metal instrument. A plastic saxophone, however, would work.